FREE SHIPPING ON MANY ITEMS - Every category included from our entire web site. Choose from art glass earrings, pendants, stationary and other products. Great for birthdays, holidays, thank you's and every special occasion. Some items have substantial discounts. Kevin O'Grady Aurora Borealis Bracelet in multi-color. Borosilicate glass for long and durable wear. Artist signed and dated. Approximately .58" wide. Small fits wrists 6.0" - 6.25". 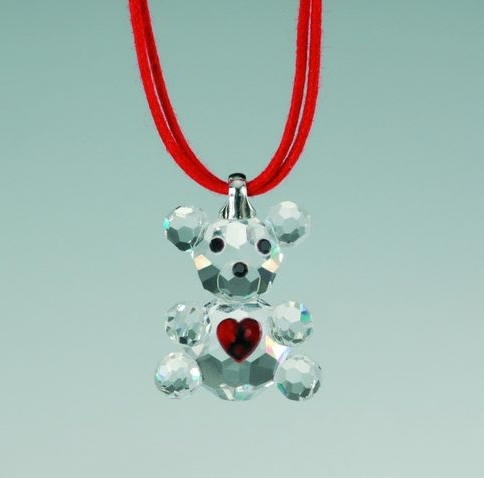 Preciosa Baby Bear Pendant, elegant hand cut crystal with black accents and endearing red heart. Double stranded red cloth necklace included. Pendant is approximately 1.1" x 0.7." Paul Katherman Blue Paisley pendant. Three dimensional pendant w/soft swirls. Colorful with rich deep blues. Durable borosilicate glass and handmade. Strung on 16.0" rubberized cord - allows it to be worn in water. Collectible jewelry from Paul Katherman. 2.35"h x 1.05"w.
Tall Brown Swan with red beak. White head feathers and approximately 21.0"h x 5.75"w x 6.0"d. Approximate weight is 7.0 lbs. Paul Katherman and his Floral Bouquet Pendant. Striking three dimensional pendant with floral design. Multiple layers of glass with crisp white background. 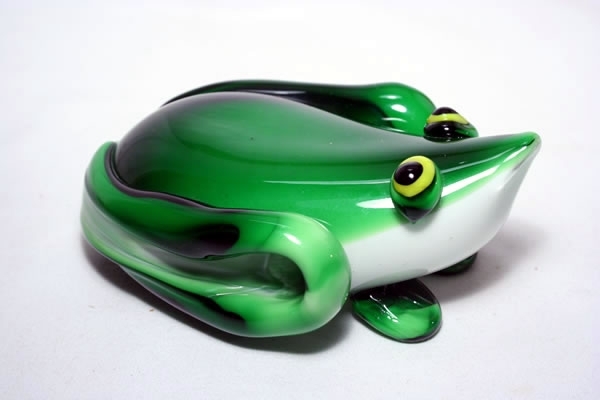 Made of durable borosilicate glass and all handmade. Strung on 16.0" rubberized cord - allows it to be worn in water. A highly collectible piece of jewelry from the Katherman Collections. Approx. 1.35"diameter. Meko Designs, hand crafted wire wrapped fused glass pendant. Iridized lavender on clear glass on two angular cut blue glass. Curled wire with three beads & wire wraps made of brass. 18", 1.5mm, 14k gold filled cable chain. Approx. 1.50"l x .80"w.
FREE SHIPPING - Meko Designs, hand crafted wire wrapped fused glass pendant. Iridized amber glass on lavender glass & curled wire w/two beads. Wire wraps made of brass, 18", 1.5mm 14k gold filled fine cable chain. 1.15"l x 1.05"w.
Meko Designs, hand crafted wire wrapped fused glass pendant. Iridized lavender on blue glass on two angular cut yellow glass. Curled wire with thwo beads & wire wraps made of brass. 18", 1.5mm, 14k gold filled cable chain. Approx. 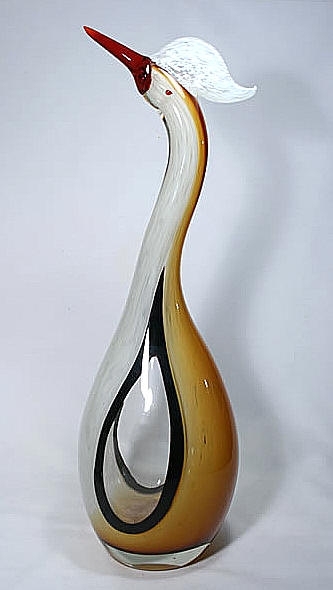 1.75"l x .90"w.
Michael Hudson, and her colorful handblown Glass Pumkin in yellow/orange. Great for Halloween and displaying throughout the year. Approx. 4.25" dia x 4.0"high. Green Frog with bulging yellow/black eyes. A squatting frog, with white underbelly and eyes gazing towards the sky. Approximately 2.10"h x 3.88"w x 5.30"long. Dynasty Gallery Glass Jellyfish Sculpture Black. Glows in the dark when exposed to light. Available with Cherry Wood Multiple color led. Approx, 6.5" h x 3.70"w and 4.5 lbs. Dynasty Gallery Glass Jellyfish Sculpture Cappuccino. Glows in the dark when exposed to light. Shown with 4" round multicolor led and mirrored surface. Approx. 6.5" h x 3.75"w & 4.5 lbs. Dynasty Gallery Glass Jellyfish Sculpture Coral. Glows in the dark when exposed to light. Available with Cherry Wood Multiple color led. Approx. 6.75" h x 3.70"w and 4.5 lbs. Dynasty Gallery Glass Jellyfish Sculpture Pink. Glows in the dark when exposed to light. Shown with Square 4" Cherry Wood Multi - Color led. Approximately 6.50" h x 3.75"w and 4.5 lbs. Dynasty Gallery Glass Jellyfish Sculpture White. Glows in the dark when exposed to light. Available with Cherry-Wood and round multi-color led. Approximately 6.50" h x 3.75"w and 4.5 lbs. Kevin O'Grady Lagoon II glass pendant. Made with pure gold & silver, full of treasure and fantasy. Water resistant 18" rubber cord necklace glass bale and silver clasp. 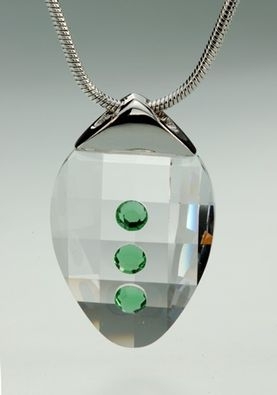 Approximately .85"w x 1.35"h.
Preciosa Lea Pendant Peridot oval shaped elegant hand cut crystal. Three peridot crystals in center. Includes 17.70 chain. Pendant is approximately 1.0" x .60". 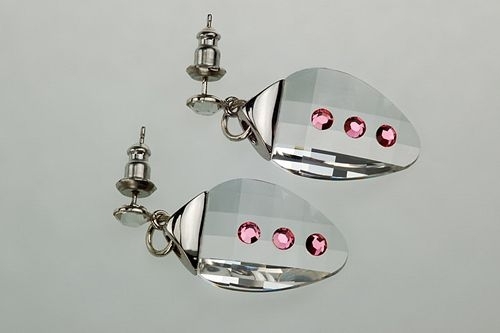 Preciosa Lea Rosa Earrings. Oval shaped elegant hand cut crystal with three rosa crystals in center. Approximately 1.4" x .60".